Margaret is a skilled practitioner who takes a practical eye to protecting your rights. Where possible, she will explore cost-saving negotiations outside of court. Yet if an agreement cannot be reached on one or more issues, Margaret is equally at home in the courtroom. Her bottom line is protecting your interests, helping you transition into a new lifestyle, and plan for the future. Each family law case has unique facts and circumstances. There is no one-size-fits-all approach. That's why Margaret takes the time to listen to your needs and determine a legal strategy appropriate to your goals. When children are involved, she will work to minimize any additional upset to them. The bottom line is helping you move forward as smoothly as possible. 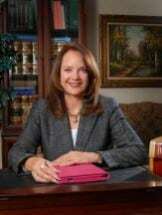 Her firm's dedication to family law, estate planning and probate law issues has not gone unnoticed. The firm has been profiled in the local media and many of our clients are also referrals, which says a lot about our practice and the personalized attention my team gives to every case. Margaret is attentive to each client's unique situation. I will listen to you and my firm will take care of you. Contact us today to learn how my knowledge and experience can help you.